Consider the thermostat. It consumes sensory information, and transmits electrical signals to your furnace. In fact, one of the most important things to know about a thermostat is its input-output maps. If you know how your thermostat will behave at any temperature, you can reasonably say that you understand the device. Suppose you return from vacation, and set your thermostat to room temperature. The thermostat turns on the furnace. How does it know when to stop? Most thermostats accomplish this by comparing the current temperature with the desired temperature, or goal. Imagine the current temp is 60 degrees, and desired temp is 70 degrees. The difference between the two (70-60 = 10) is called the error signal, which the thermostat uses to adjust its current strategy. If the error signal is high, the furnace might be turned on full-volume; if it is 0.5 degrees, the furnace might be turned down, to avoid overshooting the target. We call this process negative feedback (negative, because the error signal is constructed by subtracting from the target state). Negative feedback is the mechanism by which a thermostat to exert its “will” on the environment. A control system might be overdamped, and approach the goal too slowly. Sometimes a control system will be underdamped, and overshoot the goal before “coming back around”. 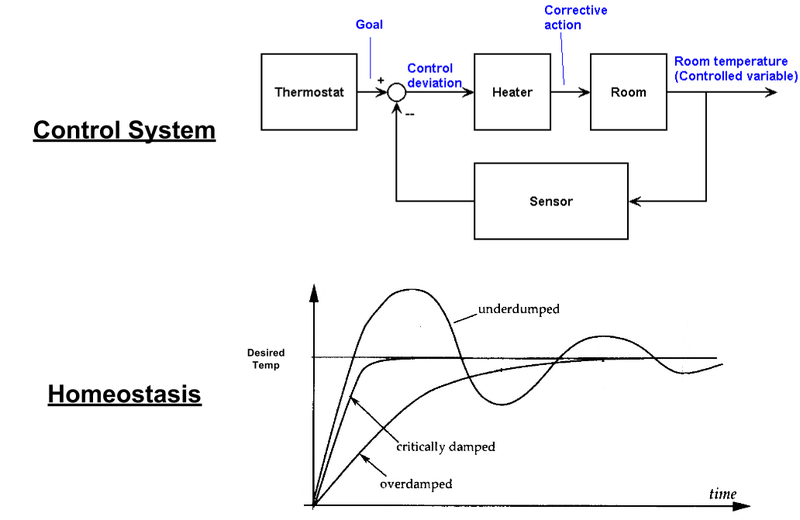 Ideally tuned systems are critically damped, and suffer from neither of the above problems. This ability to realize and maintain a goal state, is called homeostasis. Machine Learning. Remember error signals, above? Scalar errors drive reinforcement learning, multidimensional errors drive supervised learning. Biology. Life is a control process whereby an organism regulates itself. Body temperature maintenance is a classic example here. The study of biological control systems is known as cybernetics. Every effective regulator of a system must include a model of that system. The mathematics behind this statement are explored here. But allow me to inject a biological interpretation onto this result. To be effective at survival, every animal must have a concept of itself. Biologically, this theorem explains why we find a cortical homunculus (“little man”) etched onto our cerebrum. Philosophically, this theorem hints at how complex animals like us came to acquire a sense of Selfhood. These implications are explored here.